You are currently browsing the tag archive for the ‘turning 30’ tag. Typically, I would never increase my mileage for weeks on end, as I’ve been doing since I started to run again post-injury about six and a half weeks ago. Also, I usually avoid bumping up my mileage from week to week by as much as I have been doing in the last few weeks (7.5 – 10M increases). Instead, I try to build gradually for three to four weeks, and then cut back on my long run to allow my body to recover, and avoid 10M jumps. So why have I not been following my own advice? Well, with so little time to train for Portland, I didn’t feel that I had time for cut-back weeks. I know that’s dangerous reasoning – the goal is to reach the start line feeling strong and fresh, but in order to feel strong and fresh, I have to both train and rest sufficiently! I’ve been toeing the line between over-training and hitting a healthy maximum (relative to where I’m at with my injury – compared to what I was doing in my last training cycle, my mileage has been low). I’ve been trying to be careful, but I admit that on many days I have purposely overstepped that line because I wanted to complete a run, which isn’t smart. After struggling through several speed sessions recently (for example, my VO2 interval session last Wednesday, my threshold intervals yesterday, and my MP 6-miler this morning), I know my legs just aren’t getting enough recovery time from my usual one or two rest days to give me the high quality sessions I’m demanding of them. Too much overloading, not enough backing off. This morning, in particular, was tough – I remember killing a MP run on the beach last year, perfectly pacing 5M starting at 8:15 down to just under 8:00. Today, however, for my 3M @ 8:30, 3M @ 8-8:15, I was fighting to hit 8:30 for the first half, and then just barely managed to up the pace on the way back. I was ready to keel over by the end of this run – it was challenging last year too (running MP on sand, even packed, is hard! ), but I shouldn’t have been that fatigued. I thought – maybe – since I’ve lost a few pounds in the last couple of weeks, that I should be a bit faster, so running MP wouldn’t be as difficult, but that doesn’t seem to be the case. Hopefully once I give myself some proper time off, during the taper and after the race, I will see the benefits (if I can keep off the pounds, that is!). At least I’m looking more athletic! I’ve tried multiple times to slim down this year, without much success, so I’m really pleased with my (unintentional) progress in that area. It’s often when I finally stop focusing on it that it actually happens! I’ve been eating as I normally do, but not snacking as much since I’ve been so busy running around doing a billion things rather than sitting bored at my desk, and of course I have been training more, so it makes sense. It’s such a pleasant surprise though, since I gained weight (partly muscle of course) when I trained for my last two marathons, and I almost always gain weight when I go home, since I drive more/walk less. Anyway, I plan to keep my 18 miler in the schedule for this weekend – just going to try to get through it as best as I can, without worrying too much about pace (at least it’s not on crazy trails this time). However, this morning confirmed that unless I miraculously start to feel better, I need to cancel my 20 miler the following weekend. I wanted to try to squeeze one last long run in two weeks from the race, to boost my confidence levels, but I think it will end up doing more harm than good. Better to just do a “short” long run of 10 miles and let my legs rest up for the big day. It’s not an ideal place to stop, but it’s not like I haven’t done a marathon before! Which brings me to my race day mantra – which when I’m not simply counting to 12 in groups of 3 (matches my MP cadence perfectly), is, “I WILL do this. I CAN do this because I HAVE done this.” I say each part in counts of threes up to 12 (“this because” flows together in one set of three beats). It’s very simple, but is in line with how I feel at this stage – I may not be as fast as I’d like to be, but I know I WILL finish because I’ve completed the distance twice before. Running one more long run isn’t going to change anything dramatically! So 18 miles will be my stopping point. I happened to plan this run for this Saturday, the morning of my 30th birthday. I know, smart move right? Then again, it makes sense in my schedule, and it certainly will justify all the amazing food (and cake!) that I will be eating throughout the day. I’ll be in so much pain (judging from 15 miler at least) that I’ll even get a head start on feeling what it’s like to be OLD! 🙂 But best of all, I’ll have a running buddy who will most likely be in more pain than me – not only because he is five years older, but also because he’ll be super jet lagged! Haha! Yep, E is flying into SFO tonight from London for a ten-day visit, and I can’t be more excited. Although I’m keeping my actual birthday fairly low key (an intimate bbq with family and a couple close friends who live locally), I’ll be having a party up in San Francisco the following weekend. 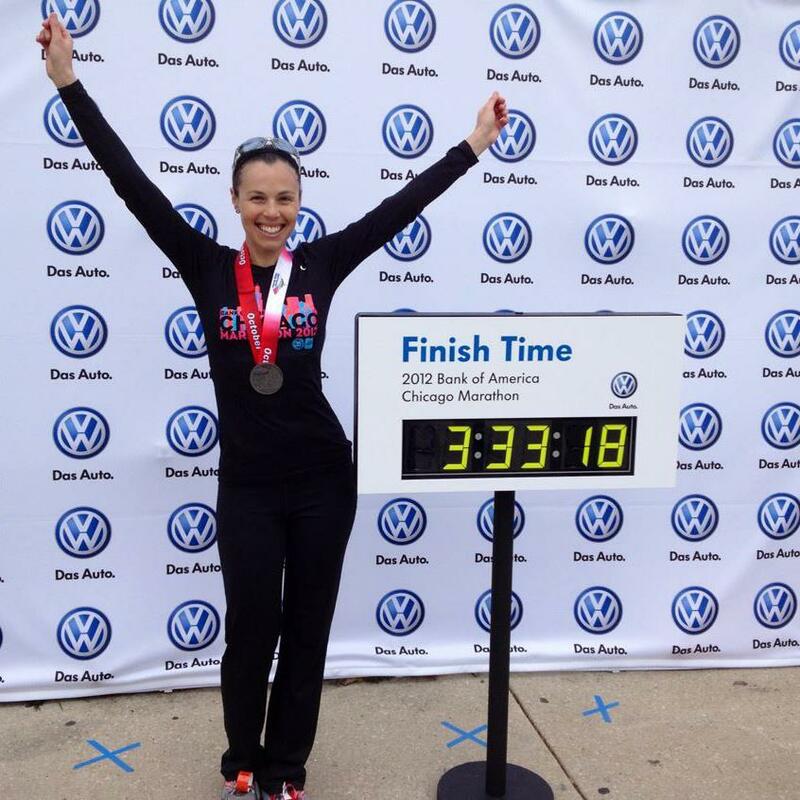 Yet another reason to skip that 20 miler – so I can devote more energy to celebrating! Lastly, I can’t help but mention Boston 2012 – I know my chance of getting a spot with my NYC 2010 qualifying time is extremely slim, but that doesn’t mean I have to give up hope entirely just yet right?! 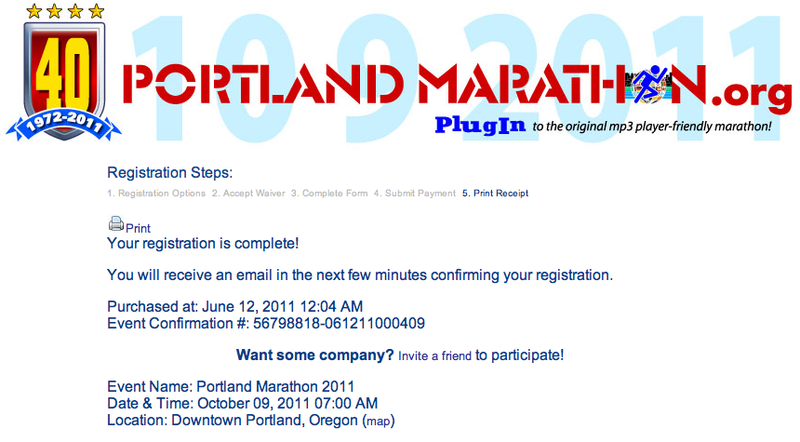 Did I seriously just register myself for the Portland marathon on October 9th? And put my predicted time down as 3:35 (otherwise known as the new BQ time)?! Yup – apparently I did. So much for my marathon hiatus…Then again, it will have been nearly a year since NYC, so that’s a pretty solid break! It was very early this morning and I couldn’t sleep, so I turned on my computer and received the following information: there will be no more RRCA certification courses in 2011 (I had emailed the head of coaching at RRCA) and thus Portland is my best shot unless I want to wait until 2012; my cousins are coincidentally moving to Portland next week, so I now have family in Portland; and, someone I went to high school with will be running so I also know another marathon participant! 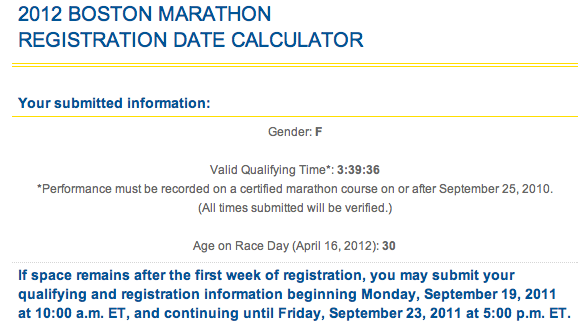 Within the hour, I was suddenly registered for both a coaching course and a fall marathon! BOOM! As for the 3:35 predicted time – that’s my next lofty marathon goal, as I have a feeling 3:39 will be too slow to get me into Boston 2012 this September. (I will know for sure on September 19th – fingers crossed!) I am certain that I have a 3:35 in my running future (perhaps even 3:30 in good conditions) if I put in the work, but I’m pretty sure I won’t have enough time to make it happen in Portland. Things like being a new Aunt, turning 30, sorting out my future etc are much higher on my list of priorities. But I figured, what the hell, may as well put it down anyway! I’m self aware enough to know I’m far too competitive to let myself perform below my best, unless I specifically announce that I’m doing it on purpose (and even then it’s still hard to accept my sub-par time)! So it’s only natural that with this new opportunity coming up, I would want to improve my time. My recent laid-back races have been refreshing and fun, but I am starting to miss being in prime racing shape and going after a big goal. And reaching it. Best feeling ever. Highly addictive. However, I’m trying my best to be realistic and accept that I can’t do everything I want to do at 100% effort all the time, as much as I often try. For instance, it dawned on me that my heaviest training week would line up exactly with the week leading up to my 30th birthday. I am swearing to myself that I will not let training interfere with my (most likely two-week long) festivities – my time may suffer as a result, but I only turn 30 once! Also, a couple weeks before that, I will be spending time with my sister and newborn niece – I’ll fit in as much training as I can, as I would normally do even without Portland in the calendar, but again, not the most important thing going on, obviously! At least I’ll have three weeks of tapering right after my birthday, so that should be doable. I’m a bit sad that E won’t be able to join me, and that Team Claire (my parents) won’t be able to come either, but that’s fine. I’ve had enough race experience to know the drill! Hopefully I’ll meet some interesting people in the course, in addition to connecting with my cousins and my high school friend, so that I can have some familiar faces around me after the race, at the very least. I would hate to run a marathon entirely on my own, without anyone to celebrate with/collapse on afterwards!